What weather can we expect to be affecting us in Morzine? The verdict is that winter 2012/13 is going to be a good one to be in Morzine. Now it might seem biased for me to say that, but it is not without reasons I make that claim. Firstly we need to understand some facts (maybe dispel some beliefs). Altitude is not the major contributing factor to amount of snow fall. Avoriaz (part of the ski area surrounding and directly accessible from Morzine) is consistently in the top 3 resorts for snow fall in France (top 5 in Europe), competing with the likes of Val D’Isere and Val Thorens. Some reports actually put Avoriaz as the resort in France with the highest annual snow fall. This is due to 2 major factors, being in the Northern Alps and thus getting all the northern weather systems first, and the climate created by the Jura Mountains just to the north of Lake Geneva and the lake itself. This is cue to start talking about orographic cloud, but that’s for another time. Morzine is not a ski resort. Yes tourism and skiing in particular now form the major part of what the town has to offer, but it was not always the case, as Morzine has been round for a lot longer than skiing. Founded on farming and slate mining the town was well established before the first hotel was built in 1920, the first ski lift didn’t appear until 14 years later. What this means is that the town has not been planned and situated for best access to the snow. It does however sit in the base of a valley now surrounded by 12 other ski resorts, to which it links very well. Yes Morzine itself is only at 1000 meters, but all the skiing it can access is well above town. Now weather prediction is a science that many would argue is not very scientific, despite the amount of research and study that has gone into it. On a broader scale however much is known and things can be predicted to have an effect, even if some times the exact effect is still somewhat unpredictable. Last year was a good snow year for the Alps, the reason being given was due to a shift in the Jet Stream. 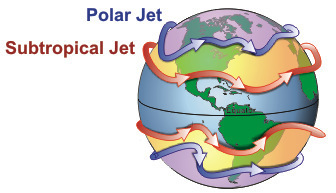 The Jet Stream is a narrow band of strong wind in the upper levels of the atmosphere. Usually about 30,000 feet above the ground it has a strong effect in driving storm systems. There are actually 2 jet streams, but in this case it is the Polar Jet Stream that has remained dominant bringing arctic air further south and allowing the weather systems (storms) of the North Atlantic to run consistently across North Eastern Europe. More weather and colder temperatures means more snow, but not so good for summer in the UK. http://www.mountainmavericks.com/blog/are-we-heading-for-another-ice-age/ ​but either way the verdict is that the pattern will continue this year. Indeed there is already evidence that winter is on it’s way, snow has been falling down to 2000mtrs for a month now, we’ve had frosty mornings and I won’t go into the list of local folklore that has been quoted.